I love summer but each year I do look forward to the fall fashion collection. Those cute suede ankle boots from Ash (see image below) are on my wish list, as well are these other fashion items that really go well with the boots. 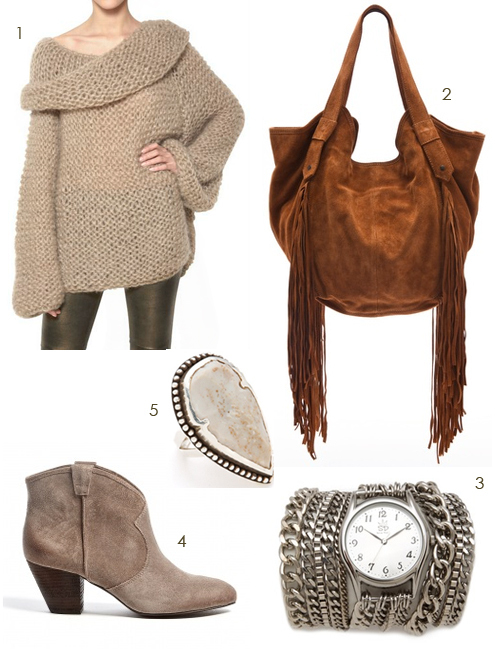 1. alpaca knit sweater, 2. slouchy suede shoulder bag with fringes, 3. chain wrap watch by Sara Designs, 4. taupe brushed suede ankle boots from Ash, 5. arrowhead ring by Pamela Love. I adore this knit sweater! I could easily have 5 of these in several different colors. However, I am known to buy multiples of the same thing in the same color!